Rat Pack stars Dean Martin and Sammy Davis Jr. appeared on the big screen in 1984, featured in a film called The Cannonball Run II. It was a sequel to the original Cannonball Run from 1981 which also starred Dean and Sammy, but this time they were joined in the cast by the Rat Pack's leader Frank Sinatra. 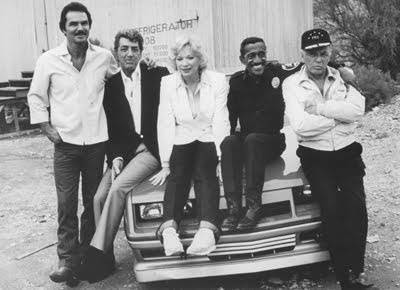 The movie starred Burt Reynolds and featured stars including Dom DeLuise, Jackie Chan, Jamie Farr and Mel Tillis reprising their roles from the first Cannonball Run film. Also appearing were Ricardo Montalban, Telly Savalas, Marilu Henner, Tim Conway, Don Knotts, and Rack Pack friend Shirley MacLaine. Even Frank Sinatra's close friend, restaurant owner and Sinatra bodyguard Jilly Rizzo had a part. It's a broad action comedy like the original Cannonball Run, about a cross-country auto race based on a real race held in the 70's. The sequel brought in $28 million in box office receipts, falling well short of the original, but it is noteworthy as it represented Frank and Dean's final feature film appearances. For more information on the film, visit Wikipedia or IMDB, and for information on a contemporary tribute to the Rat Pack, visit The Rat Pack Impersonators page on the Web.